The present text is a reflection of Archbishop Marcel Lefebvre on the significance of the cassock which was written during his time as superior general of the Holy Ghost Fathers. The measures taken by certain bishops in various countries in the matter of ecclesiastical dress are deserving of thought, since they may have consequences which are by no means unimportant to us. In itself, the wearing of the cassock or clerical dress has meaning only in so far as this dress marks a distinction from that of the laity. The matter is not primarily one of propriety. At most, the high-buttoned waistcoat of the clergy marks a certain austerity and decorum; this the cassock does even more. It is rather a mark of the cleric or of the religious by means of his dress. It goes without saying that this symbol should be characterized by modesty, decorum, and poverty, not their opposites. Clearly, this distinction in dress must give rise to respect and suggest detachment from the vanities of this world. It is well to lay particular stress on the chief quality which distinguishes the cleric, the priest, or the religious as do the forms of the soldier, the police, or transport workers. This idea is manifested in all religions. The religious chief is easily recognizable by his garments, often by their accompaniments. The faithful attach great importance to these distinctive marks. A Moslem leader is immediately identifiable. The distinguishing marks are legion; rich garments, rings, necklaces, and surroundings declare the presence of one particularly honored and revered. The same is true of the Buddhist religion as of the whole Christian East, whether Catholic or no. The feeling of the faithful, particularly in its reverence for the sacred and its wish to receive the blessing of heaven on all rightful occasions through the ministers of God, is a legitimate aspiration. Until the present day clerical dress seemed designed to distinguish a person consecrated to God, but with the least possible outward sign, especially in those countries where the suit is exactly like that worn by the laity. In some countries such as Portugal and, not long ago, Germany, the jacket was knee-length. Priests accustomed to wearing clerical dress in those countries think of it as an outdoor suit, not worn indoors. Moreover, the wearing of such garments outdoors was made compulsory by anti-Catholic State legislation. That explains the desire to return to the cassock as soon as the priest was within clerical buildings, presbyteries or churches. The spirit in which clerical dress is worn in these countries is thus vastly different from the attitude taken by some priests to its adoption. To estimate the import of the measures taken by the bishops, the considerations to which they refer must be studied. Confronted with the wearing of lay dress bearing no indication of the clerical state and in order that they may the more strongly forbid this practice, the bishops have authorized the wearing of clerical suits, but have not encouraged it and, still less, made it obligatory. Now, it is observable that since these episcopal rulings the wearing of lay dress has made enormous progress, even where it had not previously occurred. In many dioceses these measures gave rise in practice to the abandonment of any sign distinguishing the priesthood. The rulings have been wholly overstepped. The question is no longer one of the cassock in the presbytery, or even of the jacket in the parish. It is important to ask ourselves: is it or is it not desirable that the priest should be marked out, recognizable among the faithful and the laity; or, on the contrary, bearing in mind the efficacy of his apostolate, should the priest no longer be distinguishable from the laity? Si de mundo fuissetis, mundus quod suum erat diligeret, quia vero DE MUNDO NON ESTIS, sed ego ELEGI VOS DE MUNDO, propterea odit vos mundus-If you were of the world, the world would love his own, but because you are not of the world, but I have chosen you out of the world, the world hates you (v. 19). Nesciunt eum qui misit me-they know not Him that sent me (v. 21); et vos testimonium perhibebitis, quia ab initio mecum estis-and you also shall bear witness, because you have been with me from the beginning (v. 27). Omnis namque pontifex ex hominibus ASSUMPTUS pro hominibus constituitur in iis quae sunt ad Deum-for every high priest chosen from among men is appointed to act on behalf of men in things pertaining to God. It is clear that the priest is a man chosen and set apart from others. St. Paul (Heb. 7:26) says of our Lord that He is "segregatus a peccatoribus-separated from sinners." This is what the priest who has been especially chosen by God should be. To this first consideration must be added that of the witness to God, our Lord, that the priest must bear to the world. "Et eritis mihi testes-you shall be witnesses unto me" (Acts 1:8). Witness is a word often on our Lord's lips. As He bears witness to His Father, we must bear witness to Him. This testimony must be seen and heard without difficulty by all. "Men do not light a candle and put it under a bushel, but upon a candlestick, that it may give light to all that are in the house" (Mt. 5:15). The priest's cassock achieves both these ends clearly and unequivocally. The priest is in the world without being of the world. Though living in it, he is one set apart and protected from evil. "I pray not that Thou shouldst take them out of the world, but that Thou shouldst keep them from the evil, for they are not of the world, even as I am not of the world" (Jn. 17:15-16). The witness of the word, which is indeed more essential to the priest than the witness of the habit, is yet greatly aided by the clear manifestation of the priesthood given by the wearing of the cassock. The clerical coat, though it goes some way towards this, is more ambiguous. It is not a specific mark of the Catholic priest. As for lay dress, it does away with all distinction, renders the bearing of witness more difficult and the preservation from evil less effective. This disappearance of any outward witness by means of dress clearly indicates a lack of faith in the priesthood, a failure in respect for the religious attitude of one's neighbor, besides cowardice and a lack of courage in one's convictions. For almost a hundred years popes have continued to lament the progressive secularization of societies. Modernism and Sillonism (1) have diffused their errors on the duties of secular societies to God and to the Church. The separation of Church and State, accepted and sometimes regarded as the best constitutional solution, gradually penetrated every sphere of State activity, particularly that of the schools, with atheism. That harmful influence is still continuing, and we cannot but observe that many Catholics, and even priests, no longer have any clear concept of the place of religion, even of the Catholic religion, in a secular society and all its activities. Secularism has invaded every field, even our schools and our Catholic colleges. Religious practice is clearly on the decline in these institutions. There are fewer and fewer communicants. The priest, living in a society such as this, feels increasingly remote from such a world. He begins to feel out of place, a relic from a bygone and outworn past. His presence is tolerated. Such, at heart, is often the feeling of young priests. Thence arises the wish to fall into line with the secularized, dechristianized world, which betrays itself today in giving up the wearing of the cassock. These priests have no longer any clear conception of the place of the priest in the world and in regard to the world. They have traveled little, and their judgments in such matters are superficial. Had they lived for some time in less atheistic countries, they would have been heartened by the realization that, by the grace of God, faith in the priesthood is still keenly alive in most countries of the world. Secularism, official atheism let us say, has at one blow killed the discussion of many religious questions in divers environments. Religion has become very personal, and a mistaken deference for the opinion of others has relegated it to the rank of personal concerns and questions of conscience. Hence, every human milieu thus secularized, is pervaded by a false shyness of such a subject of conversation. That is why we gratuitously assume that those about us in our business or chance relationships are areligious. True as it may be, alas, that there are countries where many know nothing of religion, it is a mistake to believe that such people no longer have any religious feeling, and an ever greater one to think that all the countries in the world are alike in this respect. There, too, travel has much to teach us, and shows us that by the grace of God, mankind is still deeply preoccupied with the question of religion. It is to know little of the human soul to believe it indifferent to the things of the spirit and the desire for those of heaven. It is far otherwise. These principles are essential in the daily practice of the apostolate. Faced with secularism and atheism, to fall completely into line is to capitulate and remove the last obstacles to their spread. Through his habit, through his faith, the priest is a living sermon. The seeming absence of any priest, especially in a large town, is a serious setback to the teaching of the Gospel. It is the continuance of the baneful influence of the revolution, which despoiled the churches, and of the separative legislation which drove out monks and nuns and secularized the schools. It is a denial of the spirit of the Gospel, which foretold the difficulties to which the world would expose priests and disciples of our Lord. These three considerations have grave consequences for the soul of the priest who turns secular, and bring in their train the swift secularization of the souls of the faithful. The priest is the salt of the earth. "If the salt lose its savor, wherewith shall it be salted? It is good for nothing any more but to be cast out, and to be trodden under the foot of men'' (Mt. 5:13). Alas! Is that not the result which always awaits those priests who no longer wish to be seen as such. The world will love them none the better, but despise them. The faithful, on the other hand, will be grievously affected by no longer knowing with whom they are dealing. The cassock was a guarantee of the true Catholic priesthood. In the present instance and in the context of history, we are not concerned with the circumstances, motives, and intentions of a trifling matter, a question of ecclesiastical fashion of purely secondary importance. It is the very role of the priest in the world and in relation to the world which is at stake. It is this which those priests and religious who wear lay dress despite the episcopal prohibitions claim to judge. It is for this reason that the authorization of the clerical jacket has had no effect where the wearing of lay dress is concerned; on the contrary, it has served as an encouragement to do so. The question is no longer whether the priest will keep the cassock, or whether he will wear a clerical coat outdoors and a cassock in the church and in the presbytery. It is that of knowing whether the priest will keep his ecclesiastical habit or not. In these circumstances, our own choice has been to keep the habit, that is the cassock, in those provinces where it has been customary until now and the clerical coat in those provinces where it is habitual, while wearing the cassock in the community and in the church. We say "in these circumstances," for it goes without saying that in the event of new regulations on ecclesiastical dress which would safeguard the two principles aforementioned-the outward symbol of the priesthood and the Gospel witness, and that in a discreet and seemly, though clearly distinctive, manner, we should not hesitate to adopt them. My dear Brethren, may these reflections bind us to our priesthood and to our mission in this world with our whole soul. May we, when our life draws to its end, be able to say, "Father, I have manifested Thy Name unto the men whom Thou gavest me out of the world-I have glorified Thee on earth, I have finished the work Thou gavest me to do." (1) Marc Sagnier, a neo-modernist condemned for seeking to weld the Church to a particular political school of thought, gave the name of Le Sillon (The Furrow) to his organ of publication. Contained in the volume enitled A Bishop Speaks: Writings and Addresses 1963-1976 (Angelus Press: 2007, pp. 1-6) and reproduced here with permission. 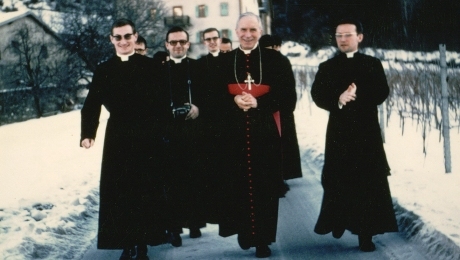 Walking with seminarians in early days. 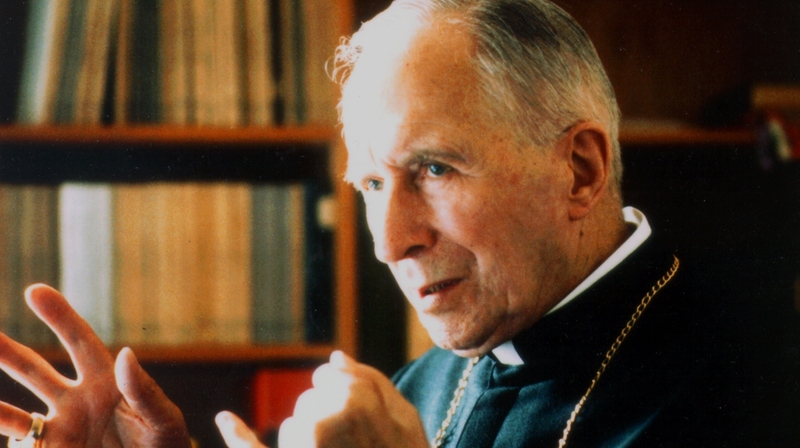 Archbishop Lefebvre founded and guided the SSPX for over twenty years.